In the class lecture of Jan 28/02 Dr Kremer gave an overview of the most common design theories and methods, including Value Engineering and Design for Manufacturability, Assembly and Simplicity. Since September 2001 I have been designing an electric bicycle, somewhat in parallel with the Senior Design sequence, but without some of the restrictions that have been imposed on the Senior Design project (refer: www.eBiciBikes.com). In this case study I would like to indicate how we have been using a combination of these various design methods to develop one small component of the eBici bike - the clamp that connects the handlebar stem to the steer tube of the front fork. 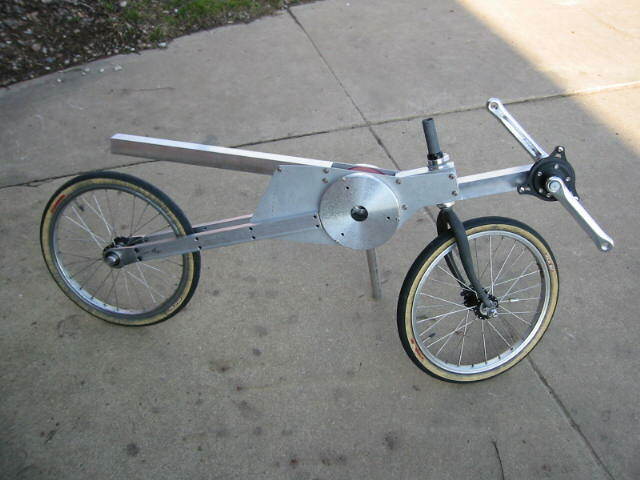 The bike is being built in eCycle in PA, and its current hardware configuration is as shown. Notice the fork steer tube extending above the frame to which we wish to clamp the handlebar stem. 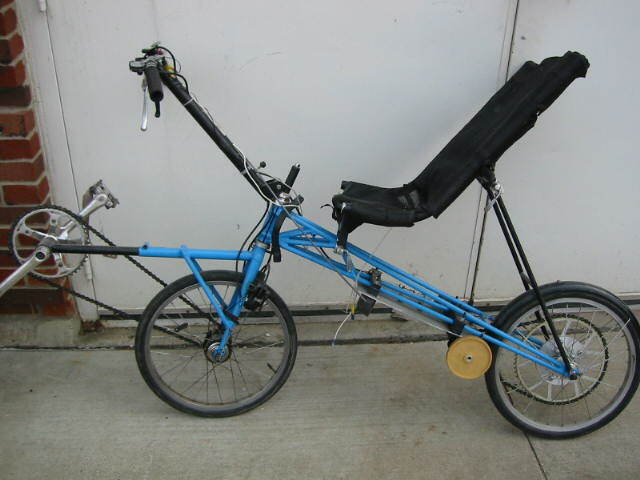 In 1994 I designed and built the Grasshopper 1 recumbent. Notice the cumbersome method of connecting the handlebar stem to the fork in the two pictures shown (picture1, picture2). 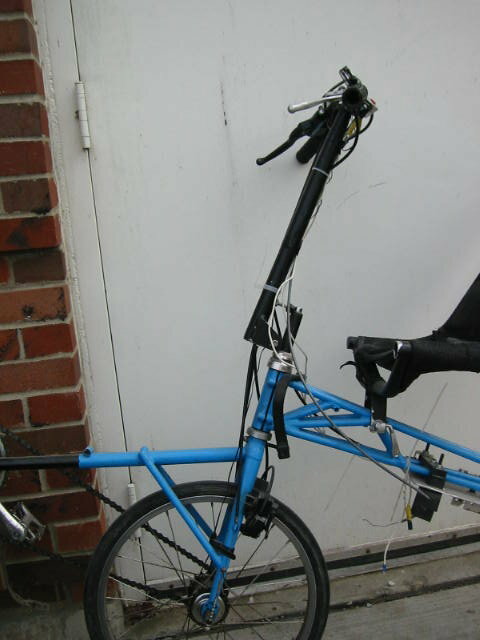 The fork was manufactured by Vision for their popular line of recumbents. Subsequently I began working with various components of the BikeE company, which currently produces the most popular recumbent design in the US. Check out the picture of Dr. Bob proudly sitting on his BikeE, and notice how BikeE connects their handlebar stem to the fork steer tube in a smooth inline manner - a significant improvement over the Vision system. 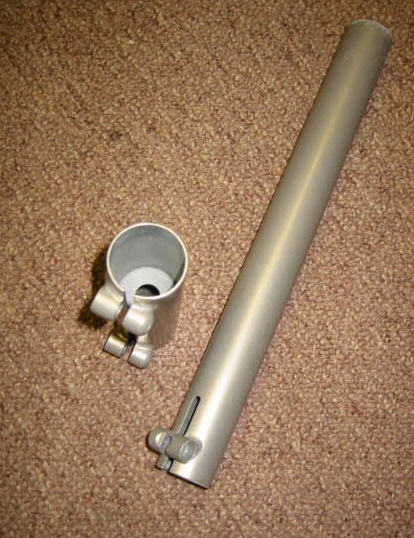 Originally BikeE used the following two tubes - the smaller tube with an inner washer to connect the "AheadSet" threadless headset, and the larger tube to connect the handlebar. All the tubes are connected with binder bolts brazed onto the tube ends. I very much wanted to use the elegant BikeE system, but could not resolve the manufacturing difficulty of brazing the "Aheadset" washer in the center of the small tube. 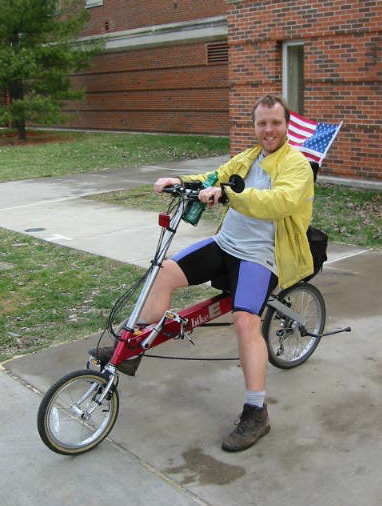 During 2000 I designed the Grasshopper 5 FWD (front wheel drive) and RWD (rear wheel drive) recumbent bikes in which I did use a tube system similar to BikeE, however without the "Aheadset" (refer: picture3). 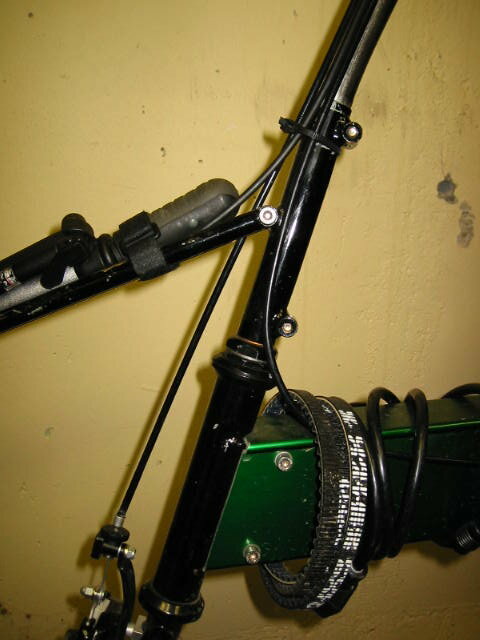 These bikes use regular threaded steer tubes and headsets, however inside each steer tube a 6" piece of tubing having the same diameter as the stem is fixed into place with Loctite adhesive, with 3" sticking out. The clamping tube then clamps the tubing on the fork stem as well as the handlebar stem. It was with this precedent that I came to the design review process in eCycle during December 2001. One of the problems of a threaded headset is the need for two 35 mm spanners for correct adjustment of the headset bearings. We resolved that by choosing the DiaTech headset available from Gaerlan, as shown in the following picture taken from Gaerlan's webpage catalog. The main feature of this headset (which is relevant to the discussion following) is that the headset bearings are tightened by hand using the threaded locknut, and then clamped into place with a 5mm allen wrench. When I gave my presentation on the stem clamp design to the design review team at eCycle, then the main response was: "Too complex, not easy to manufacture - we must find a simpler method". It was apparent that the considerations made for a handbuilt prototype are not necessarily suitable for manufacture. In the weeks following we came up with many alternative methods leading to our very elegant final design during January 2002. I do not yet have photographs of the final design so these will be presented in class. If you miss the class and are interested in seeing the final design, please contact me and I will give you copies of the relevant overheads.